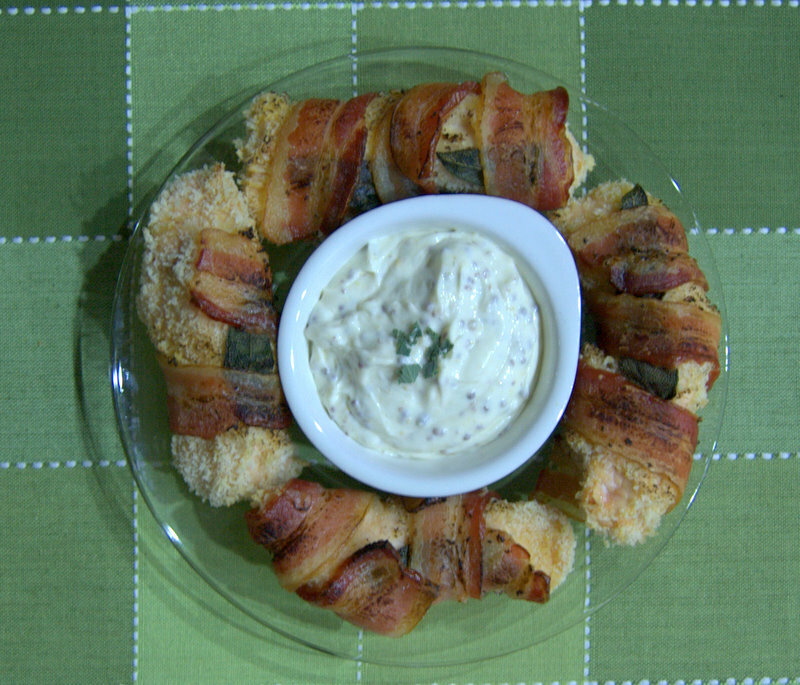 We had this dish at my mother-in law’s when we went back east for Christmas. She found it at Everyday Food. Of course, it wasn’t baked and I added the bread crumbs to it. SAVE THIS BACON SAGE WRAPPED CHICKEN TO YOUR FAVORITE PINTEREST BOARD! Preheat oven to 350 degrees F. Prepare a baking sheet by lining it with tin foil (I was out), and placing a wire rack into the sheet. Spray the baking rack with cooking spray. 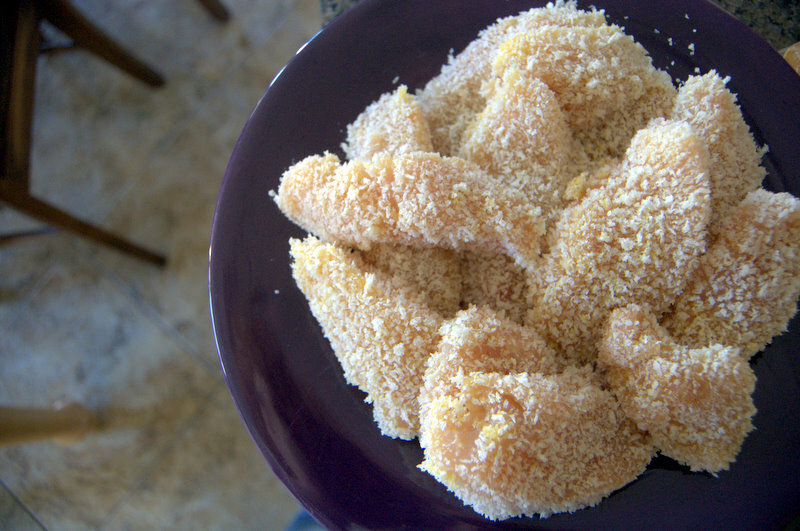 In a shallow dish, combine bread crumbs and Lawry’s Seasoned Salt. In a separate shallow dish, beat egg. Coat a piece of chicken completely with egg. Coat chicken piece with bread crumbs completely on both sides. Put a sage leaf on a piece of chicken and roll a bacon slice around the chicken to secure the sage. You will not need toothpicks, the bacon will stay wrapped around the meat pretty well. 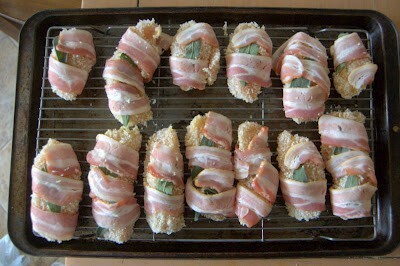 For the larger pieces of chicken I used 2 sage leaves and 2 pieces of bacon. I also think the center-cut bacon is shorter, so if you use the regular slices, you may not need two. Place pieces on prepared baking sheet. Place under broiler for 2-3 minutes until bacon is crisp, if desired. In a small bowl. combine mayonnaise and mustard. Mix thoroughly and serve with chicken, if desired. I rate everything I bake on a scale of 1-4 with 4 being the best and this Bacon Sage Wrapped Chicken earned 3 1/2 rolling pins. It was good the way I made it, and the Panko bread crumbs added a nice crunch. The broiler in my oven is not working since our oven died and Mr. 365 traded the broiler igniter for the oven igniter and hasn’t replaced it yet. 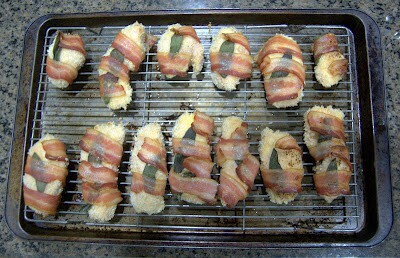 I really wanted the oven crisper, uh, no, I meant I wanted the BACON that was wrapped around the chicken crisper. I really can’t stand chewy bacon. So, since the broiler isn’t functional I took out my handy dandy kitchen creme brulee blow torch and fired that baby up. Uh, that didn’t work so well. It kind of made the bacon a little more well done, but in the process, it also burnt some of the bread crumbs. I think you should use your broiler. This looks really tasty! I think the family might really enjoy this one. Good luck with the broiler, its a necessary thing huh? What about turning your oven to 500 and moving the rack to the top? Maybe that would work? Who knows. Oh yummy! 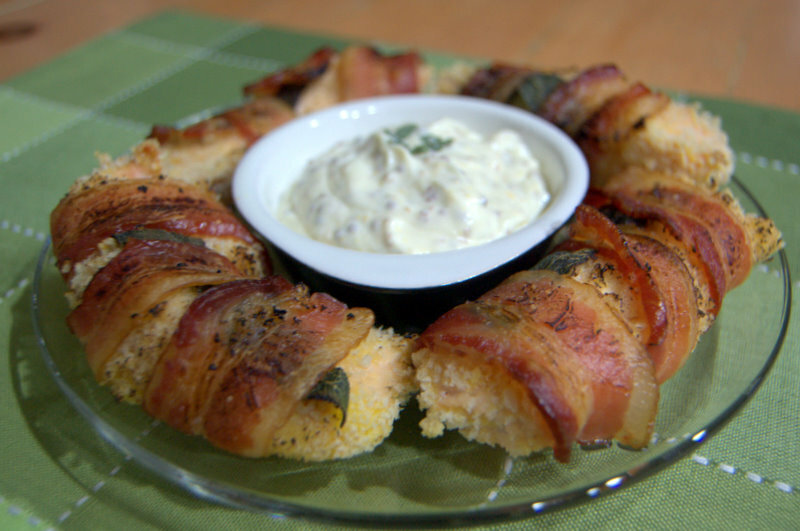 chicken, bacon and sage – i would LOVE this! Thanks for sharing, Lynne! Ooooh, this looks tasty and I’m sure the broiler would have done the trick. Or sauteing it just a bit on the stove. I know, you were trying to avoid that kind of fat laden cooking. Your dish looks fantastic! This sounds delicious and I am totally picturing you with your torch trying to finish off the bacon. I’m thinking that cranking up the heat and raising the rack might be an excellent idea in the meantime though.